After April’s release of Avengers: Infinity War, the culmination of a ten years build up in the Marvel Cinematic Universe, it’s safe to say that Marvel Studios have done more than enough to please their fans in 2018 already. But they still have more to give this year with the recent release of Ant-Man and the Wasp, the sequel to 2015’s the Paul Rudd starring origin story for Scott Lang. 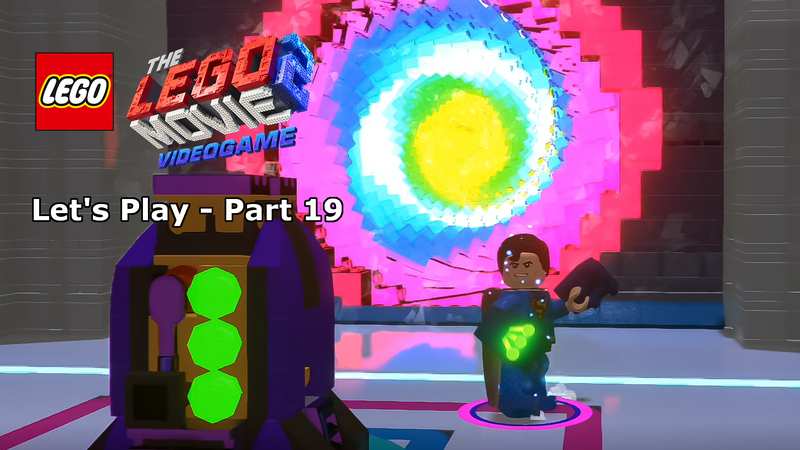 The new movie has already undergone the bricked treatment in digital form thanks to a DLC pack for LEGO Marvel Super Heroes 2, allowing fans to play as all of the main characters. 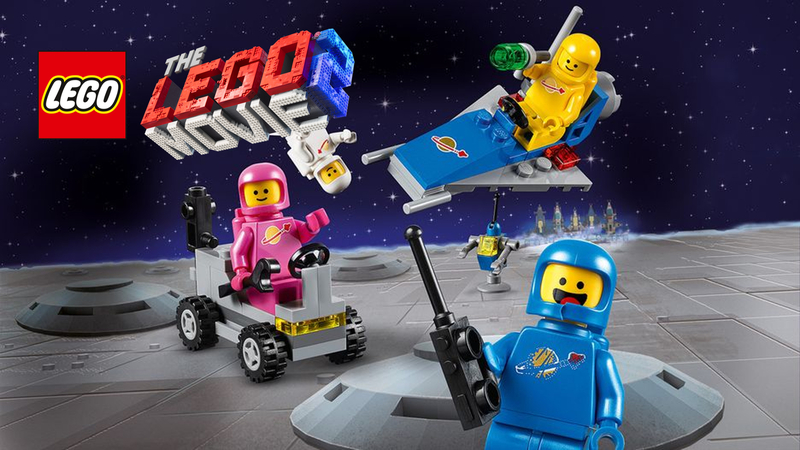 Despite this and the ever-growing appeal of the titular character and his new female superhero partner, however, LEGO has sadly followed the same plan as they did three years ago and only released the one movie tie-in set for Ant-Man’s second adventure. When you look at how many sets were released for Black Panther at the beginning of the year we have to ask, what’s wrong with Ant-Man? That said, the one set we do get turns out to be a low priced treasure, tagged at £20 and containing the three main characters from the movie. How could any Marvel fan possibly resist? As with the last Ant-Man set, everything here is exclusive. 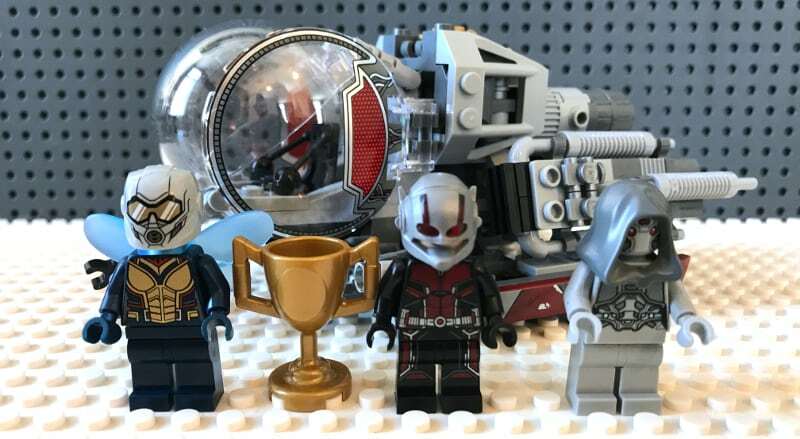 Starting first with the usual draw for most LEGO collections, the minifigures, and we have a treasure trove trio, the two titular superheroes, Ant-Man and the Wasp, as well as Ghost, the villain of the story. Having appeared in the previous set, Scott Lang’s Ant-Man is probably the least interesting of the three here. Ignoring the helmet, as it hasn’t changed at all, the design of the suit is still exquisite, with the red and black armour almost covering the entire body. 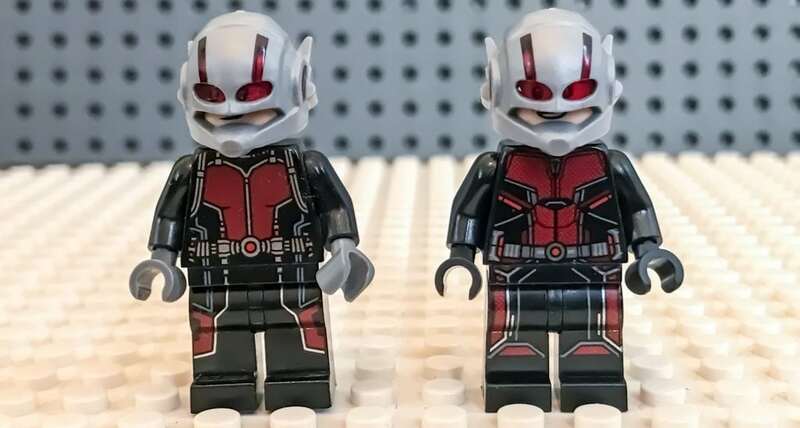 Comparing the 2015 variant (left) with this set’s Ant-Man (right) and up close you can see there are a number of differences, a much sleeker and streamlined design with a thinner belt and far more detail on the suit’s chest. It’s a decent replication of the what fans have seen in the movies from Ant-Man, through Civil War and on to the new movie the suit has clearly had some refinements made. It’s a similar story on the back, though this time it is the old Ant-Man that comes off best. The older variant gives us far more detail printing, showing off the circuitry of the suit. Sadly the newer model is very bland in comparison, again following the newer, sleeker and more refined look of the character. Ant-Man does come armed this time around, carrying a shrink ray gun, made from a simple pistol piece connected to a circular translucent piece. The design may be rudimentary, but it works brilliantly. Moving on to The Wasp, and Hope Van Dyke has been wonderfully recreated in LEGO form. 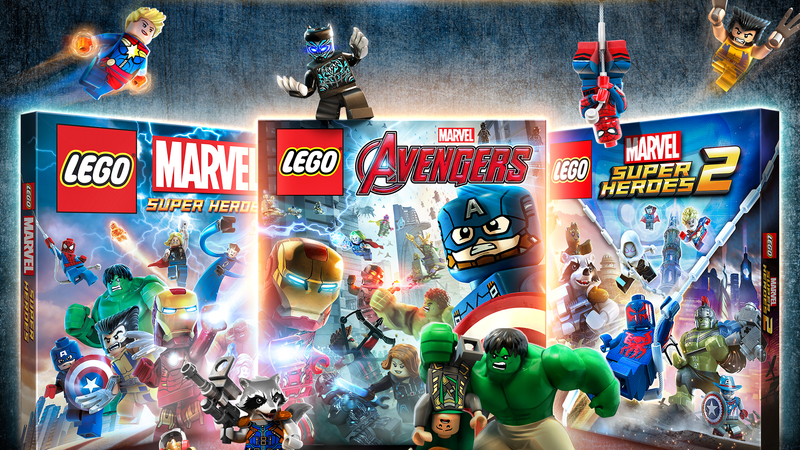 Of course, those who have had the opportunity to play the LEGO Marvel Super Heroes 2 DLC will be familiar with the design, in fact, it is identical to what you get in the game. While simplistic in design, the front torso printing does a fantastic job of creating a decent replica of the suit worn by Evangeline Lilly in the movie. The design matches the on-screen version brilliantly, from the blue ‘V’ neck, the golden chest and stomach design, to the red outlines. When compared to stills from the movie there isn’t a bit out of place here. My one of only criticism is the colours are a little off the live-action version, not quite as much as the purple used for Thanos in the Infinity War sets, but enough to notice the difference. 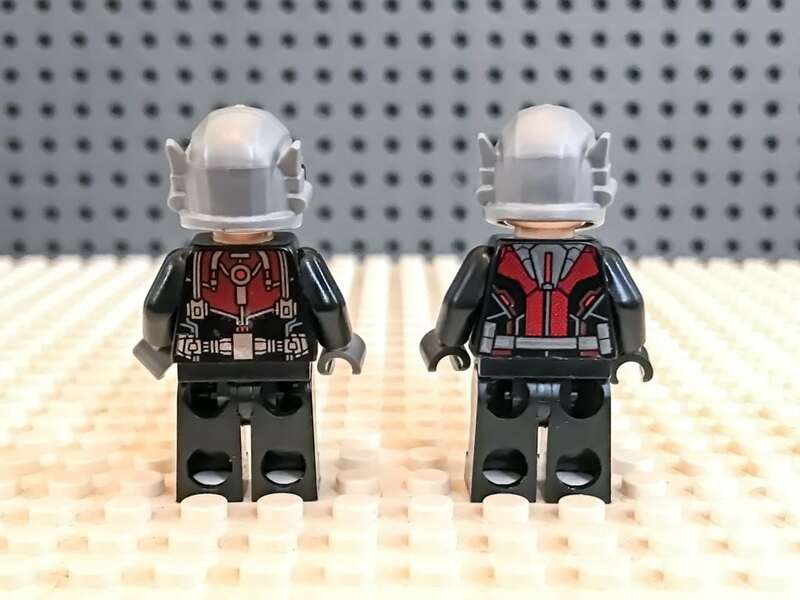 The mold for the helmet, while stunningly printed, also seems a little off compared to the source material, most oddly because, unlike Ant-Man’s figure, doesn’t have the antennae-like earpieces of the character. Moving on to the back and sadly there isn’t too much to say. not because there isn’t much printing (there’s an entire back of beautiful design there), but sadly it is covered by the translucent blue wings. Moving on to the villain of the piece and the Ghost minifigure looks like she was constructed by Tony Stark – not a bad thing, I must say. 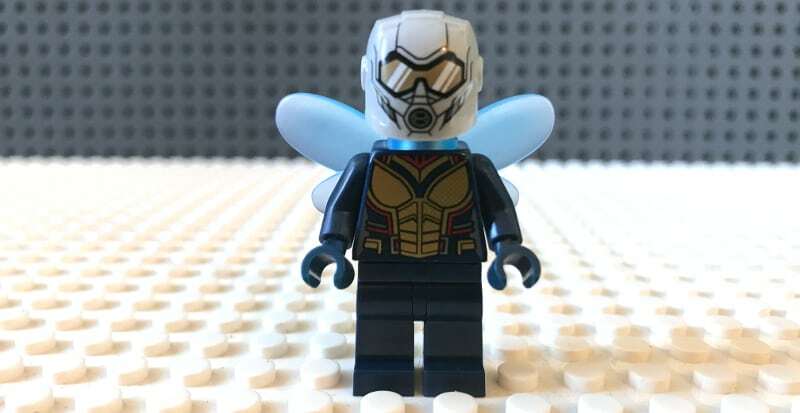 In full mask and hood, this minifigure more than fits the part of Marvel bad-guy with a robotic look created with multiple shades of grey, exactly what we see in the movie. The only additional color comes in the form of some scary-looking red eyes on the mask. The printing on the front of the torso is stunningly detailed with subtle shading under the chest plate and each subsequent section providing an impressive three-dimensional effect. The printing on the head-piece for the mask isn’t overly exciting, but when coupled with the hood piece the look is remarkably effective. Not only does the back of the torso offer a similar spectacular design to the front, but the figure’s headpiece also includes a second print in the form of the characters human face – it isn’t overly exciting in terms of uniqueness, but if you want to make your Ghost look a little friendlier then you have that option open to you. 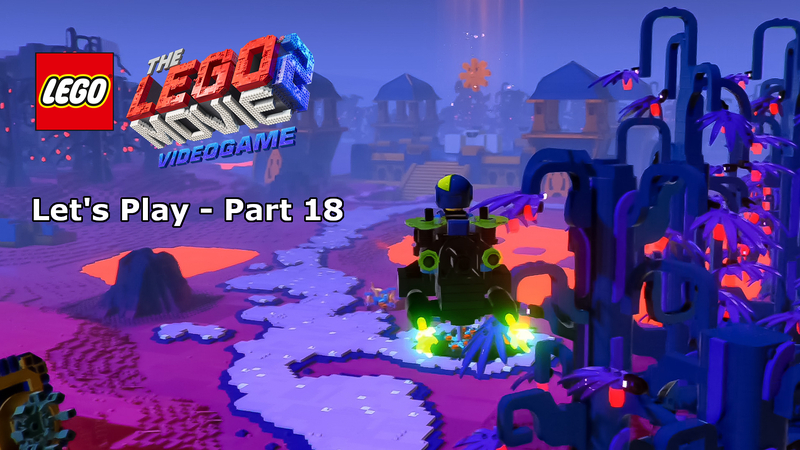 You’ve only got to watch my video review of the set to see how impressed I am with the Quantum Pod, it is a work of LEGO Design beauty. While there aren’t many high-res images from the movie to make a full comparison, it’s clear from what I have seen that this model does the on-screen version justice, including a number of subtle additions to really sell this as a replica. 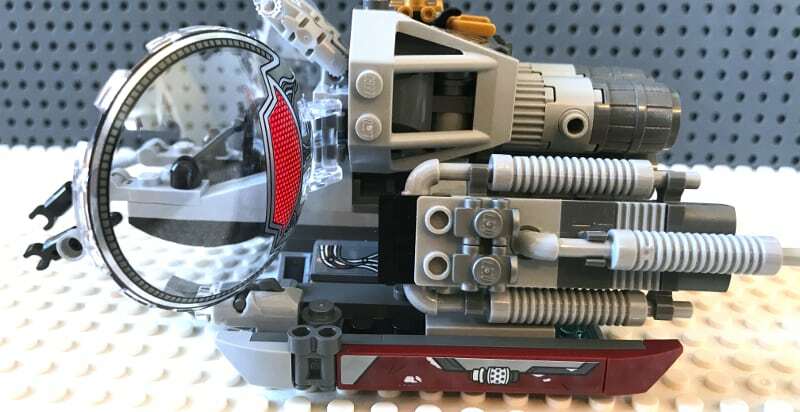 The designer has gone all out here and as a result, we’re treated to a model that not only looks stunning, wouldn’t be out of place with a stormtrooper at the helm, and has a number of interactive features which work well for the LEGO fans looking to play, or collectors looking to display. In terms of the build, you’re looking at around 20-30 minutes for an average builder, but even when compared to say, the Guardian’s pod from the Infinity War sets, this is definitely the most fun I’ve had building a set in some time. It’s never boring and that comes from this plethora of different pieces used in its construction, seriously, there are very few flat plates used here. While the pod, sadly, only seats one figure, and there isn’t too much to write home about when it comes to the interior, the outside of this model more than makes up for it. Starting with the three-part transparent “glass” module (with pre-printed exterior designs, I might add) and it’s clear to see the potential this set has for play and display. All three pieces are hinged so that the pod can be opened up, providing easy access to the cockpit. The arms on the front are also hinged, clipped on and allowing around 300 degrees of rotation on both sections. 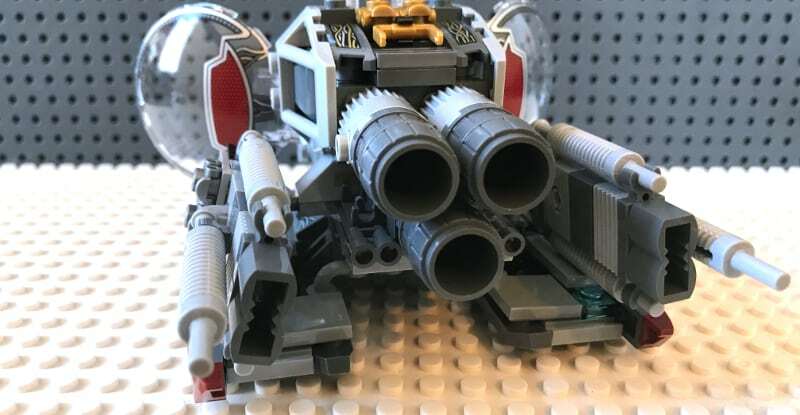 There are also two stud-launchers on the front, standard weaponry for most LEGO sets these days. Looking at the model from the side and you can see that while the design is predominantly grey, much like the movie version, some red creeps into the design. Sadly, in this case, these strips are not pre-printed and LEGO has once again resorted to stickers for additional details. I’m not a fan of stickers, myself, and when used in vast quantities they can cheapen the look of a set. Thankfully, however, that is not the case here and instead, the few stickers that are used add the necessary circuitry detail to really excel the model. One of my absolute favourite parts of the set is the thrusters on each side. 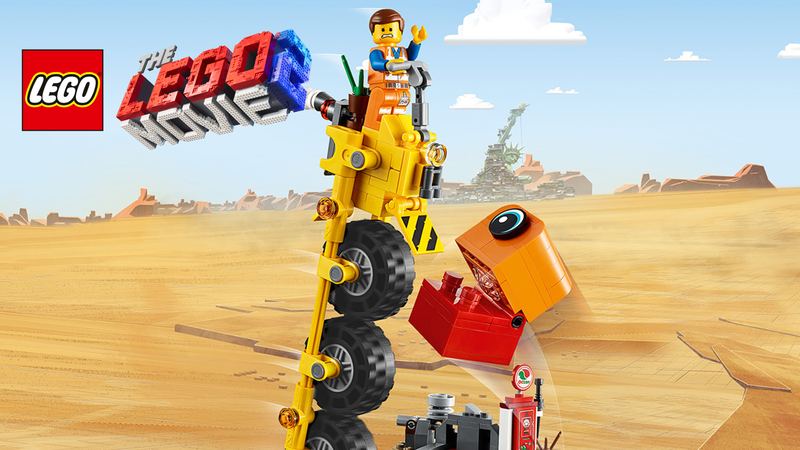 Not only were they fun to construct (genius design by the way), but they also look awesome, integrating pieces usually reserved to the exhaust pipes of large trucks, they also clip on via a ball clip allowing them to freely rotate and move from side to side. The back of the pod looks like the tail end of a Star Wars spaceship, with a three-barrelled (literally constructed from grey barrel elements) two-tone grey main rocket. It finishes off the model perfectly, and as I mentioned earlier in the review, means the whole thing wouldn’t look out of place parked next to a TIE fighter. Overall, the Quantum Realm Explorers set is a marvel (pun not intended) to behold. For such a low price you really get your money’s worth with this set and the inclusion of three of the main cast only enhances the appeal. The Quantum Pod is a wonderfully designed model in its own right, with so much detail created owing to a smorgasbord of different pieces in its build. 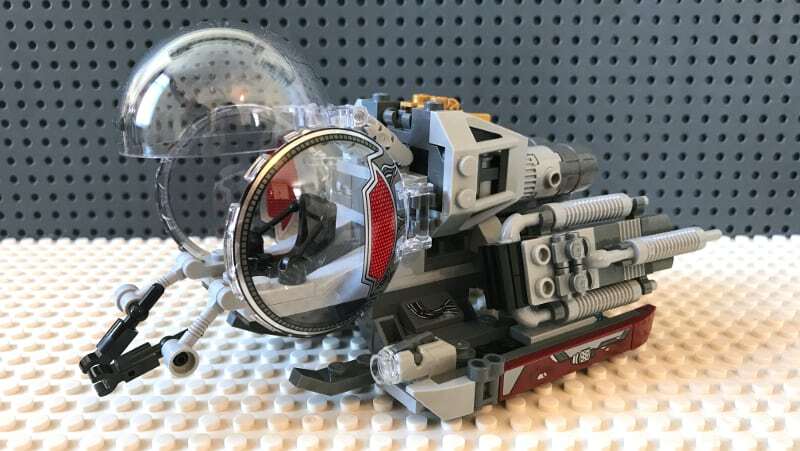 Not only this but with a decent number of interactive options and the fact that the model could easily double as an alien ship in the Star Wars universe, your younger LEGO fan is going to get a lot of play time from this set. 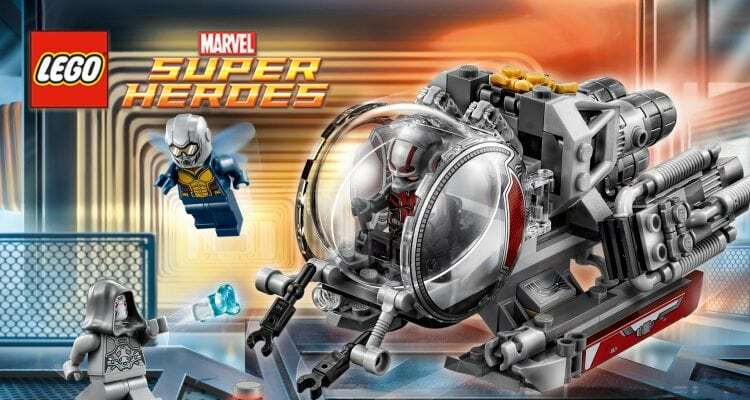 One of the best LEGO Marvel sets of 2018, without a doubt. Ant-Man does it again with another one-off movie tie-in that delivers well above its price range. 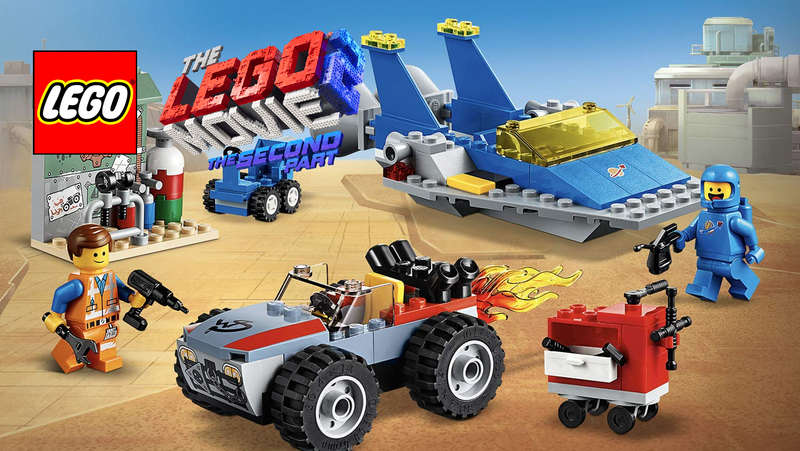 At £20, this set offers so much, including the two titular heroes of the movie and new villain Ghost, that should be more than enough to get any LEGO Marvel fan excited. 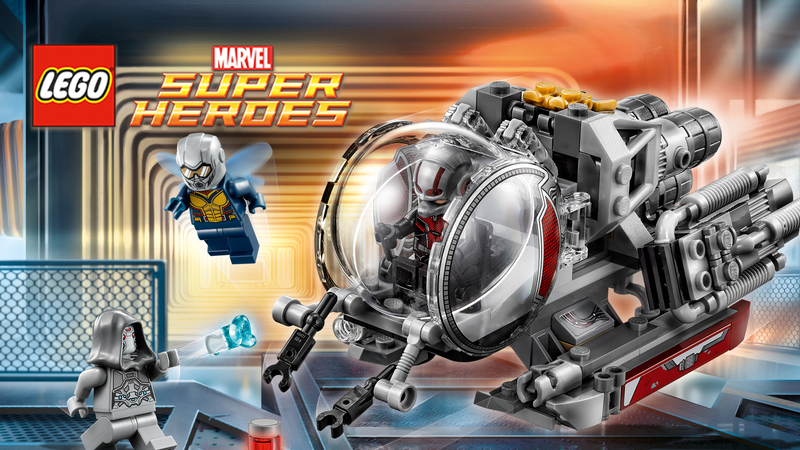 The Quantum Realm pod is a masterpiece of LEGO design, the level of detail incorporated is outstanding – Throw in all the additional moving parts and you’ve got yourself a winner for play or display. Highly recommended.